"So engrossing, so transporting, so moving, I didn't want it to end A beautiful, lyrical read-I loved every last word of it "
"Songs for a Teenage Nomad will send you searching for songs with meaning for the major events of your own life." -Cindy Hudson, author of Book by Book: The Complete Guide to Creating Mother-Daughter Book Clubs. "The best kind of song takes you on a roller coaster ride of emotions. It makes you think. You find yourself humming and pondering it for days. 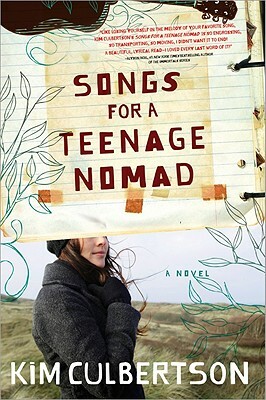 Songs for a Teenage Nomad does the book version of this. It's an unforgettable story that music lovers in particular will appreciate, but every teenager trying to find their place in the world should read." Kim Culbertson has taught high school English, creative writing and drama for over ten years in both public and private schools and sees her writing as an extension of her teaching. She lives in the Northern California foothills with her husband and daughter, where she loves to drink coffee and look at the clouds.